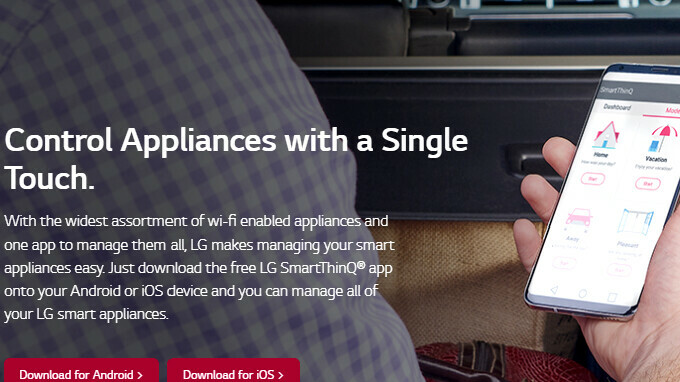 Communication is the key to understanding is what an ex told us once, and in the case of LG it means that the smartphones of the brand are able to talk with its home appliances, which in turn are connected to the worldwide Internets. The Koreans have been polishing a technology, codenamed SmartThinQ, for a while now, allowing us to manage and operate our fridges, ovens, AC units or washing machines, from the comfort of our phones. Enter the LG G7 ThinQ, and its unique Qlink communication feature for LG's connected home gear. You can change the fridge temperature, let it alert you if the door has been left ajar, and even peek inside the fresh vegetables section to see what's missing while you are grocery shopping, as you can see in the video below. To top it all off, you can soup up ice production from afar with the IcePlus function whenever you learn you will have surprise guests that love their booze chilled. Load a cookout tray, and start baking it away from home, get notified when the process is finished, check on the oven temperature, even ask your Google Home assistant how the cookies are doing. Connecting our airconditioners to the Internet was the biggest technical leap for mankind ever, if you ask us. The smart AC units of LG can be told to power up or power down from your phone, and you can set the desired temperature while on the way home from the office or from vacation. With the LG G7, however, the ThinQ brand is leveling up significantly, as it will sport the so-called Qlink protocol, making the connection process with LG's home appliances and electronics seamless. The phone will scan your home Wi-fi network for connected smart gear, and will issue a push notification, inviting to walk you through the pairing process. Once connected to the fridge, oven, AC unit, robotic vacuum, or other internet-of-things gizmos, their management will get a status bar integration, which is a whole different ballgame than just installing the SmartThinQ app. LG told us that all that convenience won't come for the sake of security, as the connection protocol is encrypted, while maintaining Qlink requires very low amounts of energy. Qlink is one small step for LG, one big step for its ThinQ home automation branding, and soon we won't have to do anything, as we'll leave the house chores to the phones, sweet. Unfortunately, Qlink - the deeper integration of LG's home appliances and electronics with the G7 - will first be available on the Korean models, while it will gradually roll out to the US ones later in the year.